The boss of a caravan park company has blamed weather forecasters for dissuading holiday makers from visiting the south of England. Tony Clish, director of Park Holidays UK, which has caravan parks across Sussex, Kent, Dorset and Devon, said forecasts were "increasingly alarmist". He said late bookings are influenced by weather predictions. However, BBC weather presenter Tomasz Schafernaker denied they were "deliberately pessimistic". Mr Clish said: "We all plan in advance and some people decide not to do things and end up missing a nice day because of the weather forecast. "It's a very late booking pattern and people wait to see what forecasters say on the TV and radio." Sussex was hit hard by flooding in June, with a month's rain falling in two days. 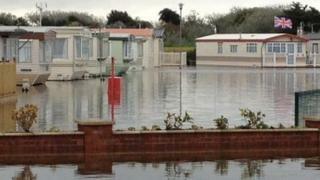 Homes were evacuated and caravans parks were flooded in Bracklesham Bay. Mr Schafernaker, who presents the weather on BBC South East Today, said: "I understand Mr Clish's frustration and there is a tendency for weather forecasters to emphasise on the negative aspects of the weather. "Fundamentally that's what weather forecasters are for - they are there to highlight the dangers. "But there is certainly no reason why we would want to dampen the sprits or be deliberately pessimistic. "It's just that our job is to pick out the most important parts of the weather which can affect people's lives. "If indeed there's going to be a shower somewhere we need to flag up that possibility."